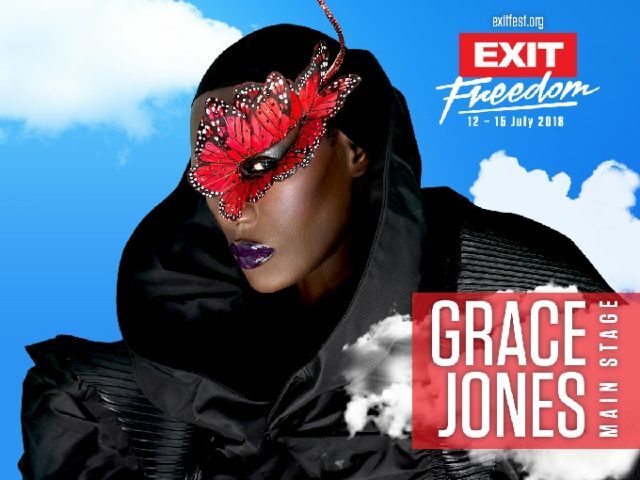 One of the most important contemporary artists, a revolutionary music and fashion icon, a supermodel and a movie star, truly immortal, the one and only Grace Jones is headlining EXIT, officialy the Best European Major Festival! This extraordinary personality comes as the living icon from the so called “Alien Club” of artists who left their unique mark on Earth before they left, such as David Bowie, Prince and Michael Jackson. She was the first to introduce avant-garde art and high fashion in the world of music, way before Madonna, Lady Gaga or Rihanna. Vogue itself proclaimed her as the “ultimate fashion muse”, and the music authority “Rolling Stone” calls her the “compelling artist and a symbol”. After the premiere at the Toronto Film Festival, the long-awaited documentary about the life of the fascinating art-rock aristocrat, dubbed “Grace Jones: Bloodlight & Bami”, will hit cinemas this spring, before her tour arrives to the Petrovaradin Fortress in Serbia on July 14! This high-society Jamaican started her career as a supermodel in Paris and New York, working together and being surrounded by the fashion heavyweights such as Yves St. Laurent, Karl Lagerfeld, Kenzo Takada and Giorgio Armani, while Issey Miyake himself chose her to be the leading model at the historic “Twelve Black Models” fashion show in Tokyo, 1976. Her androgynous face shined from the front pages of Vogue and Elle, photographed by none other than Helmunt Newton and Guy Bourdin! Grace quickly found herself in the seductive vortex or the most glamorous discotheque of all time, New York’s Studio 54, where her greatest fans, the star-studded clientele, were forever dazzled by her goddess-like, image, including Andy Warhol and Keith Haring, along numerous actors and disco magnates. She soon met her long-time companion, the famous French artist Jean Paul Goude, who turned her into a living piece of art with her wild, incontrollable energy, androgynous, superhuman looks making unforgettable live and television performances, including the famous “One Man Show” in 1982. His photographs of Grace will display in galleries, museums and art history books for decades to come. Among them is, as it was dubbed by the media, “one of the most famous photographs in the history of pop culture”, the cover of the compilation album “Island Life”, as well as a huge list of other, manually edited photographs, at the time when “Photoshop” meant the local business down the street, not the all-powerful software we know today. It is not widely known, but due to her love with Goude she rejected the leading role in Ridley Scott’s cult film, “Blade Runner”. The connection of glamour and an unstoppable force, forged into “glamazon”, the expression that describes her genuine authenticity and strength of a warrior that appears alongside Schwarzenegger in the Conan movie saga, or a fatal Bond woman who can take on agent 007. Amazing Grace still displays great fitness abbilities with ease at some of the greatest festivals and stages of the world, with lush costumes that leave the audiences at awe. After her performance at last year’s Wilderness festival in Great Britain, Telegraph perfectly summed up the bottomless energy of the cosmic being that is Grace, saying that she easily hula hooped for a total of 20 minutes, while singing and presenting her top-notch band to the audience!